Newcomer Family Obituaries - Frances S. 'Kika' Gallegos 1935 - 2019 - Newcomer Cremations, Funerals & Receptions. 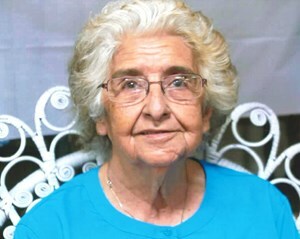 Frances S. Gallegos, 83 of Denver, passed away peacefully in her home on April 11, 2019. She is preceded in death by her parents Juan B Suazo and Adelia Ortega, sister Ursie Huerna, Sister-in-law Mary Suazo, and grandson Juan Chavez. Frances was born in La manga, NM, and moved to Denver in 1954 where she met and married Jesse Gallegos; with whom she had her five children. Frances was a restaurant owner, and enjoyed cooking for her family. She never allowed a guest to be hungry in her home, and would throw a meal together as soon as you walked through the door. She also enjoyed going to the bingo, and finding treasures at yard sales and the second hand. Frances is survived in death by her five children John (Lika), Joseph (Lisa), Rosa (Mando), Robbie (Dianne), and Manuel (Jill); her siblings Olive George, Manuel Suazo, Jane Pacheco (Lorenzo), and Viola Trujillo (Primitivo); along with her 14 grandchildren, 15 great-grandchildren, and two great-great-grandchildren, and numerous nieces, nephews, and cousins. The family gratefully acknowledges the love and support provided by George, Annie, Fran and Matt. Add your memories to the guest book of Frances Gallegos. So sorry to hear about this loss. Francis was truly a great person and always showed me kindness and love. You will be missed dearly Francis. Our love and prayers go out from our family to yours. Our family gives condolences to the Gallegos family for the loss of such a beautiful person. I have had the honor of being a friend of the family for almost 50 years and can still remember the first time I met Joe's mom. She was in the kitchen cooking and before I knew it we were sitting at the table with a plate of beans and chile. I think I called her Mom from that day forward. Such a great lady. We're so sorry for your loss. We love all of you. I miss you so much, Rest with the Angels . I know your dancing in heaven with my brother , until I see you again. Sorry for your loss! Prayers for all!